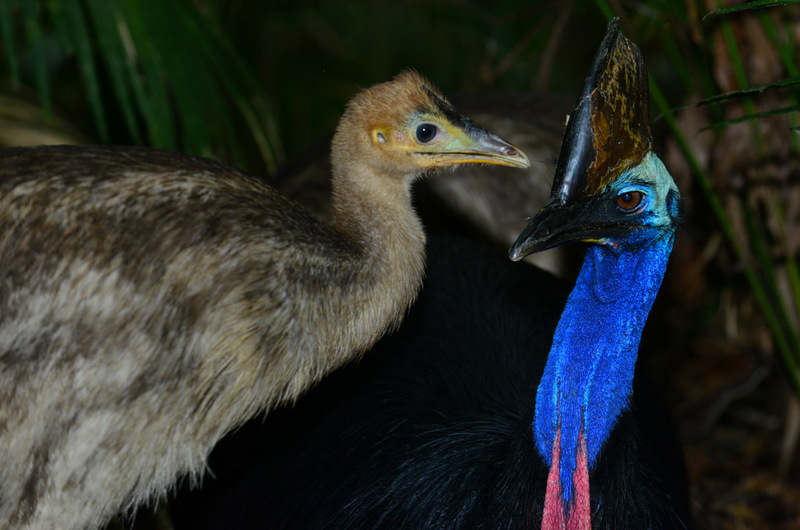 Cassowary House is the regular haunt of Dad and Missy, two endangered Cassowaries. 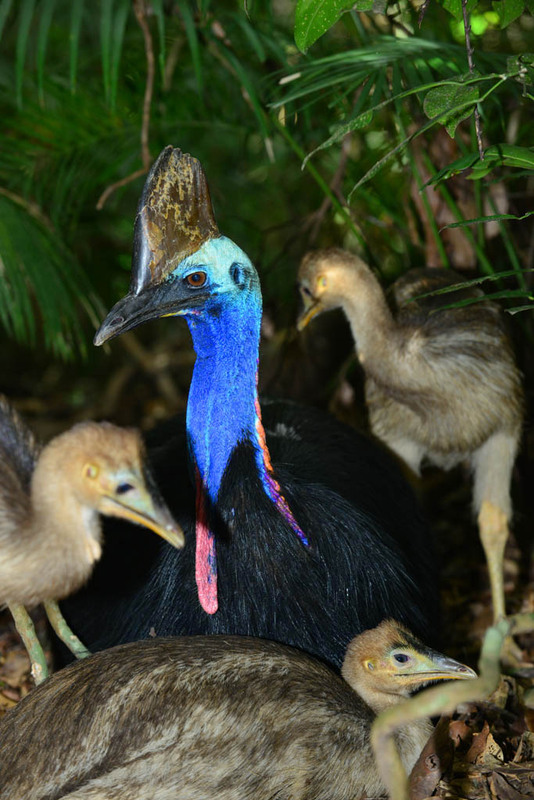 Nestled in the rainforest on Black Mountain Road near Kuranda in Queensland, Cassowary House offers a rare chance to see these beautiful birds up close in their natural environment. Dad is a regular at Cassowary House. 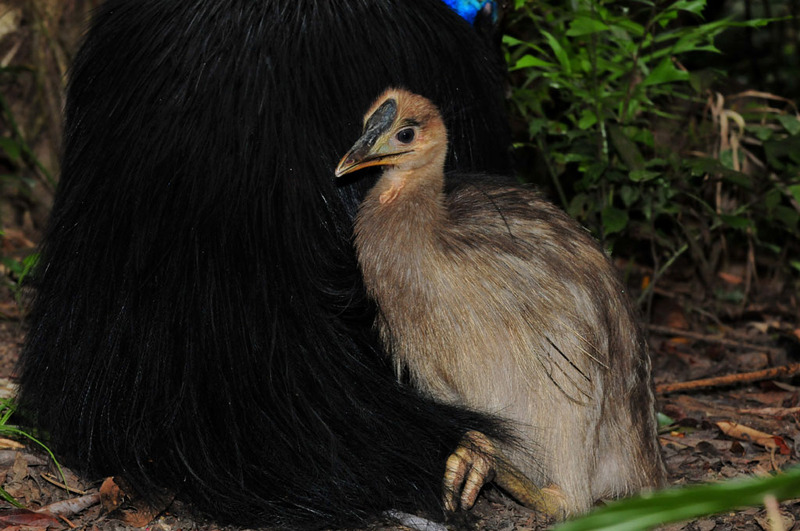 Cassowaries are flightless birds with only a few quills where their wings used to be. The body feathers are black and there are no feathers on the head and neck, but brilliant colours of blues, purples, orange and fuchsia on their drooping wattles. Amber eyes are shaded with thick black eyelashes and a helmet-like structure known as the casque sits on the head. Dad is very protective of his chicks. Females weigh up to 60 kilograms and males 40 kilograms which make them Australia’s largest bird. Their legs and feet are large to support their body, and they have a dagger-sharp claw 10 centimetres long used solely for defense. 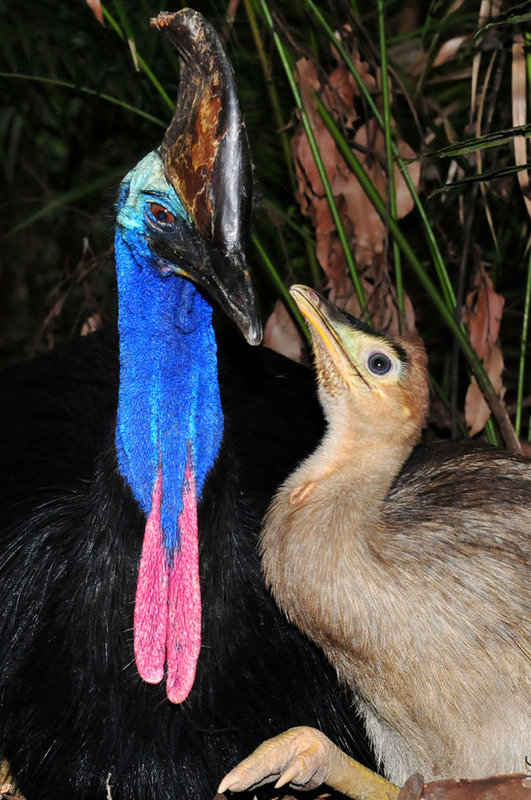 Cassowaries are solitary and only tolerate the company of others for brief periods during the breeding season, which is usually June to October. 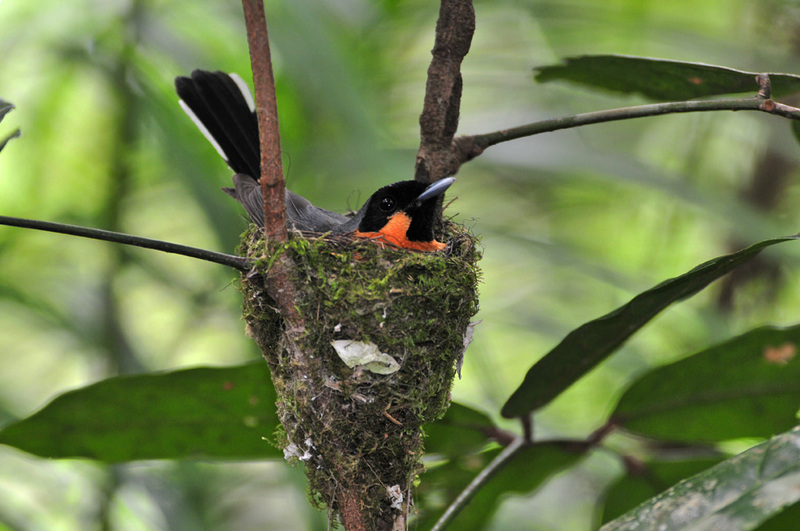 Every year, Dad builds a simple nest on the rainforest floor, and once the female lays the eggs, he incubates and cares for them for about 56 days until they hatch. He takes sole care of the chicks and is aggressively protective. Dad and his three chicks have a drink. For the past 30 years, Dad regularly visits the guesthouse because it’s in his territory. During our stay, he brings his three blue-eyed chicks in every day. He is wary at first, but soon he accepts us by just ignoring us. We make sure to be cautious and never get between him and his chicks. The inquisitive chicks come close to us, so close we can touch them. I look at Dad when they come near; to make sure he is not upset, but it is OK as long as it is the chicks that do the approaching. 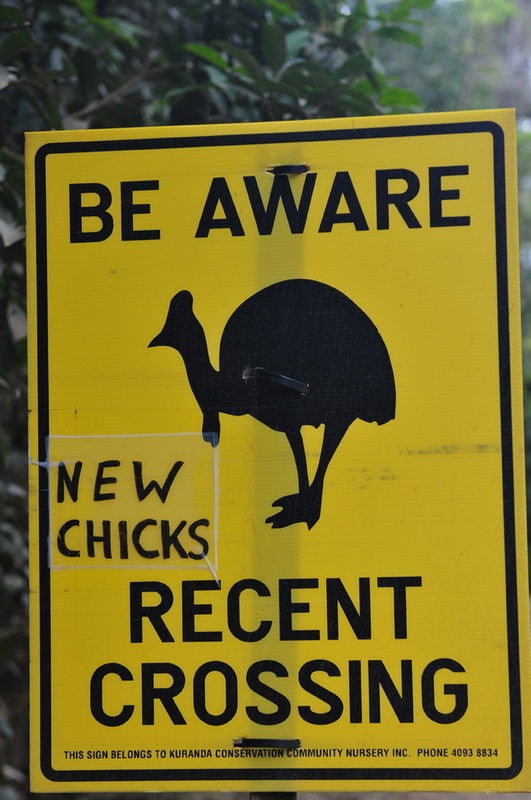 Dad and the chicks arrive at Cassowary House. Dad is watchful of everything that goes on. The chicks only have to show a little distress and he rushes to them. They follow him around looking adoringly at him, chirping happily as they forage around the undergrowth for worms and insects. They love the forest berries and fruits that Dad picks with his beak then places on the ground for them. 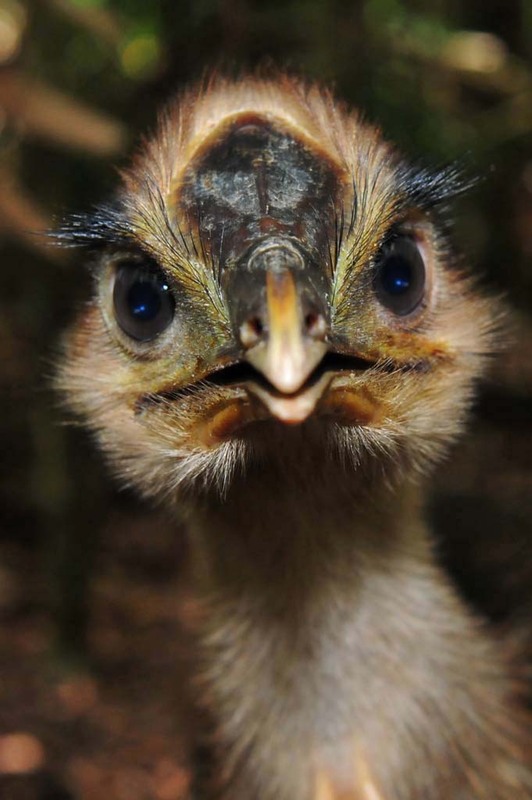 Cassowary chick has a drink. 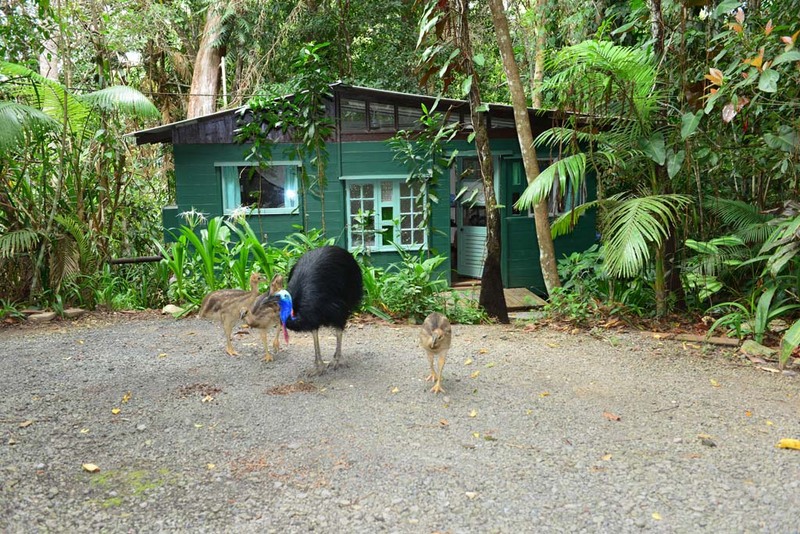 It is an endearing sight to see four cassowary bums as they all peek into the windows of the rooms at Cassowary House. The little chicks almost have to stand on tiptoe with their necks stretched so they can get a good look at what Dad’s looking at. They are real sticky-beaks. Sue, the owner of Cassowary House, tells us they will often hang around longer if there are guests as they seem to enjoy the company. After foraging and inspecting the place, Dad will settle down to let the chicks have a sleep. Dad sleeps very lightly, turning his head in the direction of every sound in the rainforest. There is an independent chick that always wanders further than the others and a favourite chick that always gets to sleep closest to Dad using his feathers as a blanket. After a couple of hours, Dad decides there is nothing exciting going on, so he gathers the chicks together, and they abruptly leave, disappearing into the rainforest without a trace. The three-month-old chicks will soon lose their stripes, go all brown and gradually darken and get the adult plumage at about three years old. The chicks stay with Dad for nine to eleven months until he drives them away when the breeding cycle starts all over again. When the female returns to breed, the chicks must go. The frightened chicks make a “Weeeeee” cry when they have to go out on their own. They are sad and do not want to leave their Dad. 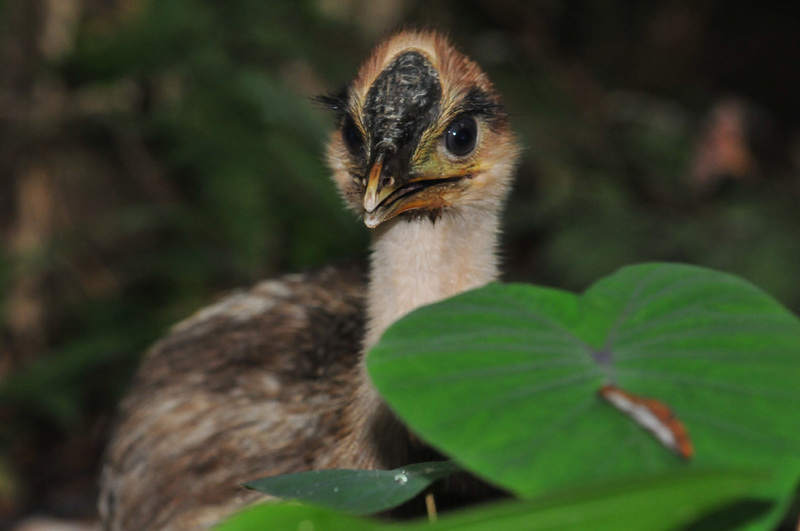 The chicks have to find their own territory, and unless a grown cassowary dies, there is no rainforest territory spare. The rainforest around Kuranda is taken up with approximately 21 adult cassowaries. These chicks will more than likely not make maturity and will die before gaining a territory of their own. They have only a 10% chance of survival when they leave Dad. 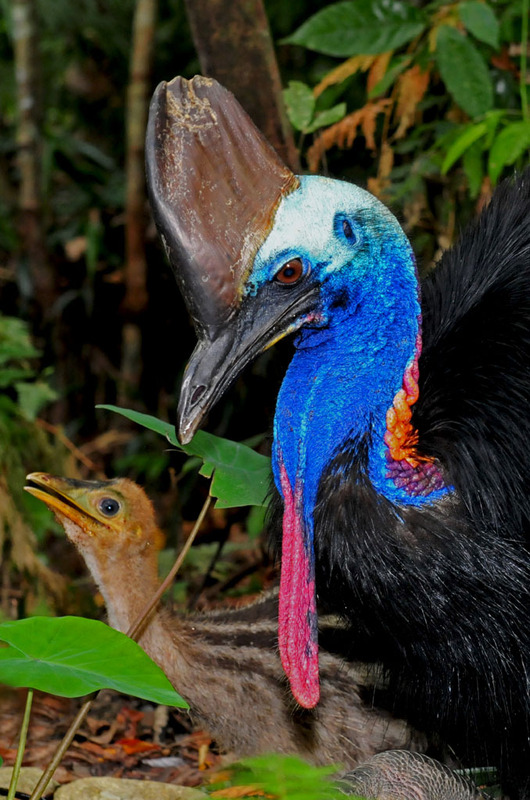 There could be as few as 1400 cassowaries left in Australia, with the rainforest in the Kuranda district having the highest population. 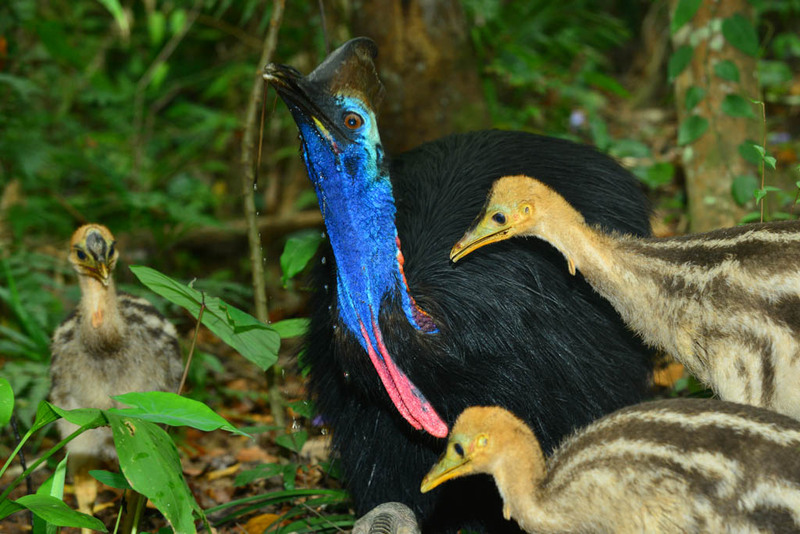 The biggest threat to cassowaries is habitat destruction. 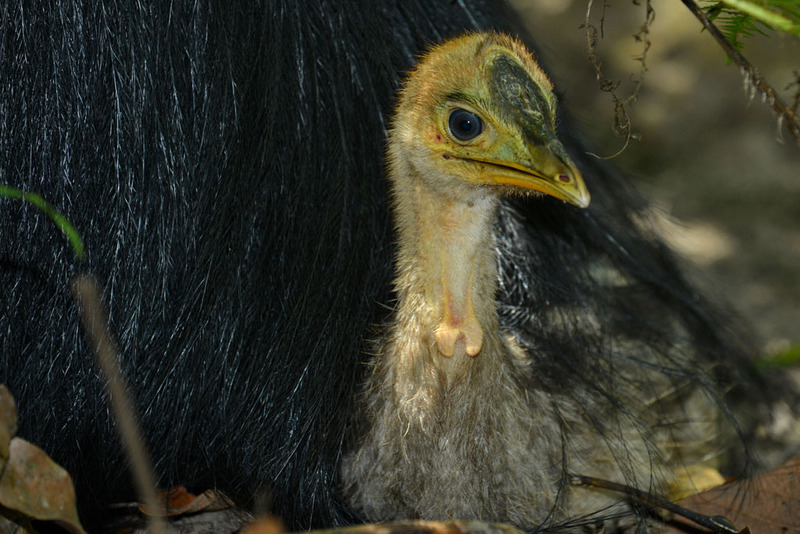 Cassowaries are crucial for the preservation of rainforest diversity due to their role as a seed disperser and some plant species rely on the cassowary to disperse and germinate the seed. We should act now so this magnificent bird has a secure future. A sanctuary for cassowaries and other wildlife. Cassowary House is a unique place, with not only an opportunity to see the cassowaries but many other birds. Catbirds, Flycatchers, Honeyeaters and Riflebirds are a few of the many birds in the area. There is also a chance to see the Musky Rat Kangaroo and the Black Striped Possum at the right time of the year. Toast, eggs and fresh fruit for breakfast. Sue and Phil have a vast knowledge of the birds and wildlife in the area and they arrange tailor-make tours for bird and wildlife watching. 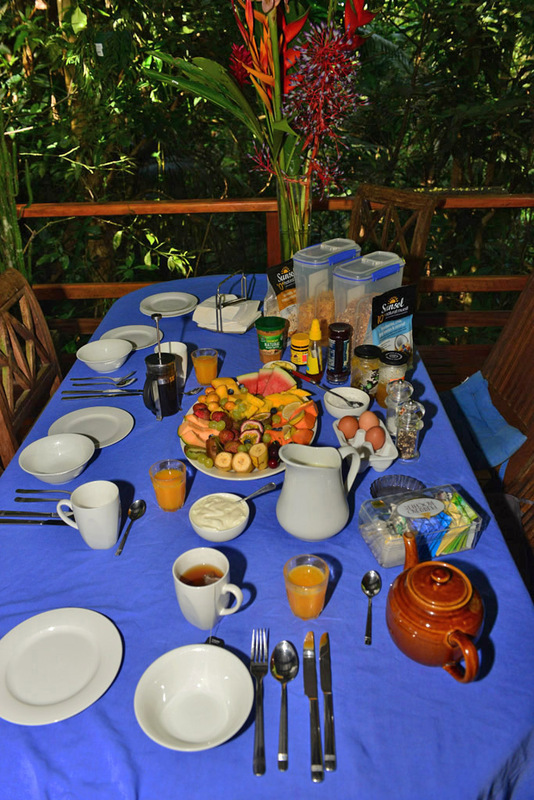 Cassowary House is a 5-minute drive or a 30-minute walk from the mountain village of Kuranda. Kuranda is 25 kilometres north-west of Cairns in Far North Queensland. Surrounded by world heritage rainforest, there are many nature-based activities, including the Skyrail rainforest cableway. The main attraction is the famous Kuranda Markets and there is also a variety of cafes, coffee shops and restaurants. We watch the Flycatcher in her nest from our deck. We stay in the self-contained Catbird cottage which is private and tucked away in the rainforest and great value at $125 ($160 with breakfast) Australia Dollars/Night. Twin and single rooms including a tropical breakfast $90- $160 Australia Dollars/Night. If you stay in these rooms, you may be lucky enough to find the cassowaries looking into your window! 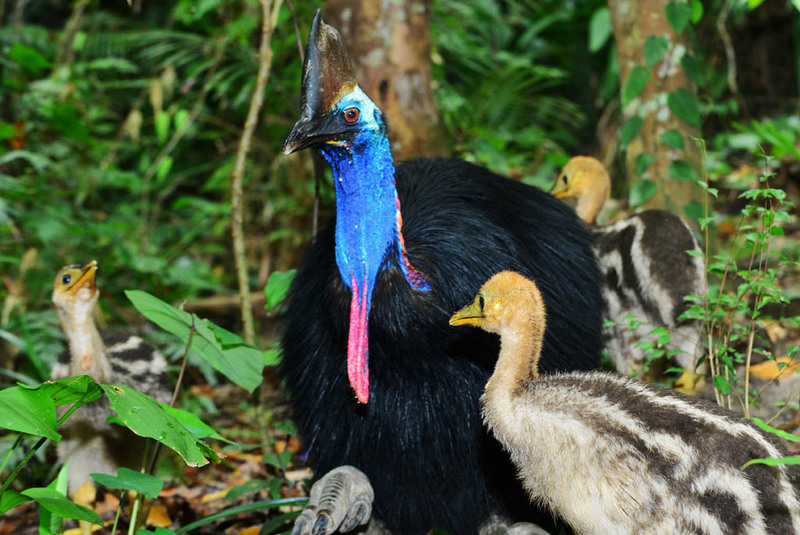 Cassowary and chicks sleep in the rainforest. Cassowaries are unique to North Queensland and therefore not found anywhere else in Australia. Other places to see them are Girrigun National Park, Mission Beach, Etty Bay and the Daintree and there is also a good chance of seeing them at Licuala Lodge in Mission Beach. 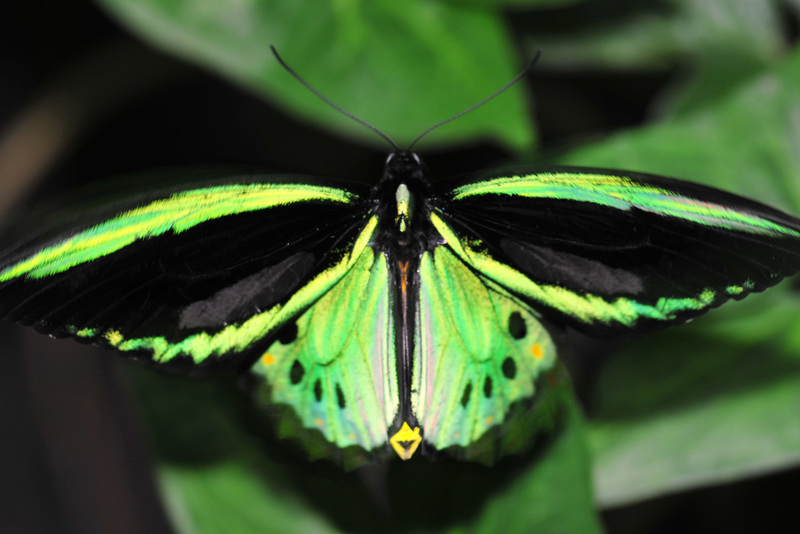 Early morning and late afternoon are the best time to spot them because during the middle of the day they rest in the cool of the rainforest. Keep a safe distance and never approach them or their chicks as they are very protective. May to November is the breeding season, with the majority of chicks hatching in summer. Hello Francisco we are not the owners of Cassowary House. We stayed their for a few days & can tell you it is a fantastic place! Here is their web address where you can find all the information. Thanks for visiting our site. I can vouch for Kuranda being a fantastic area to visit. Apart from unique arts and crafts markets and diverse wildlife there are cultural fests at various times, including an outdoor amphitheatre (for opera in the wild or live plays). Plus it is the gateway to the Tablelands and there are picturesque small communities and scenic drives through the misty mountains and a feast for the eyes in all directions. My thanks to you for presenting it so well. You have really captured the layback, mountain atmosphere of the place. And you make our precious big birds ‘people’ too! It is Soo important for tourists, and even locals who sometimes take our wonders for granted, to be made aware of their endangered status, and their ecological value, in the maintenence of our Garden of Eden. Thank you so much. I hope you choose to highlight many more Great Oz nature spots! Kuranda is sure one of the most beautiful spots in Australia Marie. Thanks so much for comments. We are doing some research on the far north & the only complaint we have is you don’t have enough blogs! Your work is beautiful and you have really shown this gorgeous bird in a way have never seen before. 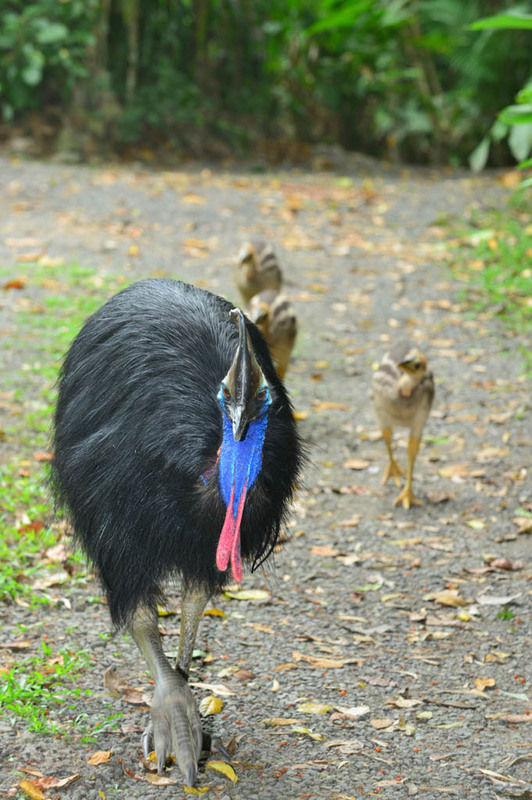 Will be very disappointed if we don’t spot these on our trip so Cassowary House will be on our must do list. Do you think there will be much chance of spotting Dad & chicks in April? Hi Shelby. Thanks for your comments. 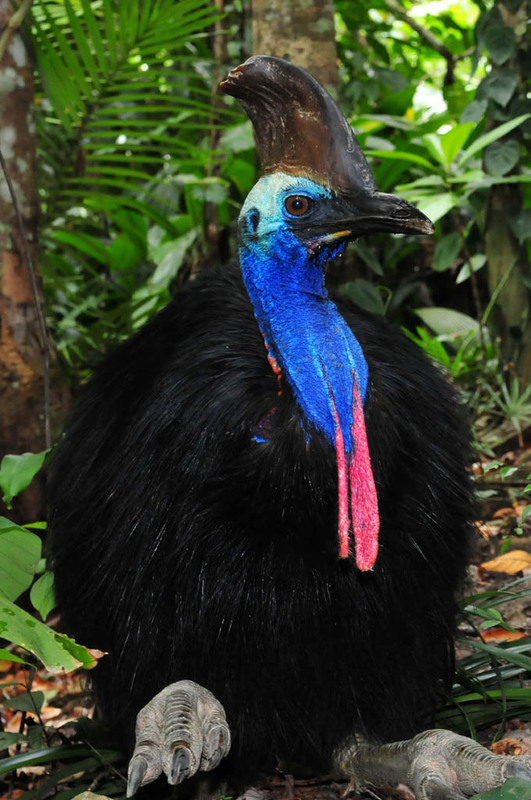 You will have the best chance to see the Cassowaries at Cassowary House. The chicks should still be around in April. We visited in January and we know the chicks were still here in April. Usually by this time they have turned a beautiful chocolate colour. 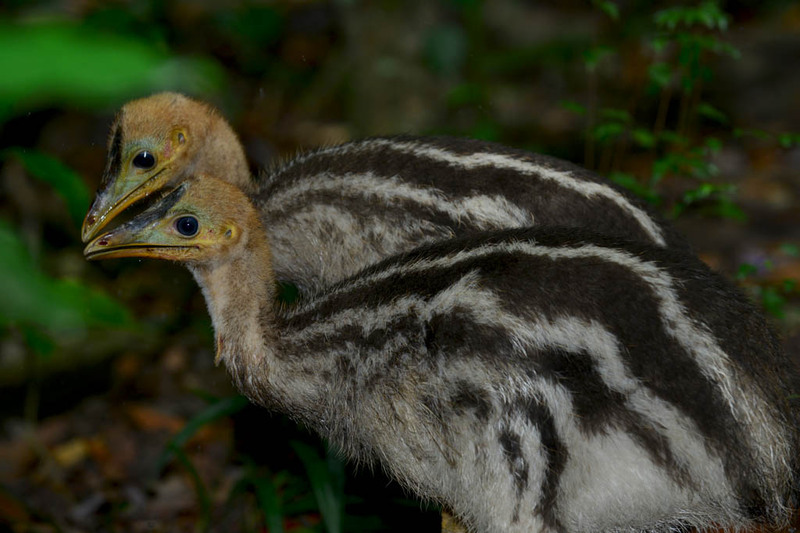 I learnt about these fascinating birds in school, I have seen them in the zoos, but it would be a dream to see them in the wild, especially with the chicks. Its great how you tell your readers all the details on where you go so they can have these experiences have a chance at getting these beautiful images. Hi Rehana. 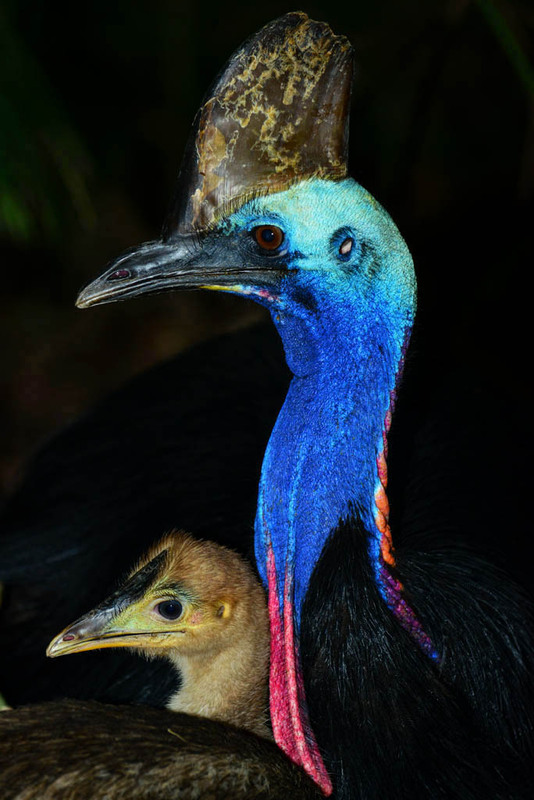 Cassowaries are an amazing bird and Cassowary House is an amazing place. It really is one of those lifetime experiences. We plan to to visit again in the future. Thanks for your comments.